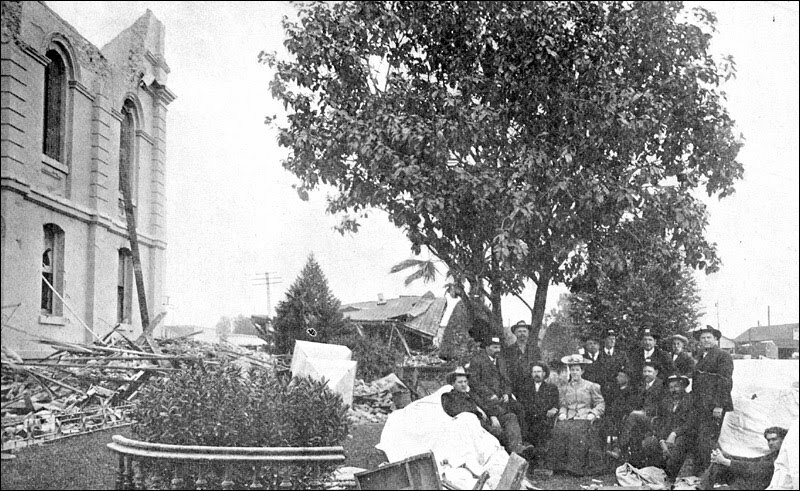 There's no disputing that the 1906 earthquake changed Santa Rosa forever, and it's easy to offer a glib generalization that the disaster hurled the town into the Twentieth Century. I've certainly suggested that here in a few posts. But I've come to realize the truth is the opposite - that the earthquake thwarted meaningful progress, and entrenched Santa Rosa in its 19th Century ways. Santa Rosa certainly looked more cosmopolitan a few years afterwards. The fires swept away the jumble of 19th century buildings that gave the downtown a "Wild West" appearance, with most stores having ornate Victorian cast-iron façades and hitching posts at the curb. In their place rose steel-framed buildings in the Louis Sullivan style - practical, sturdy, and mostly plain. In pre-earthquake photos, downtown could have been Main Street, Dodge City; in newer pictures, it was Commerce Boulevard, Modernburg USA. Looks deceive; these were just new buildings in the same old town. There were no infrastructure changes in the disaster's wake. The Civil War-era layout of the streets was unchanged; the water system remained perpetually on the brink of collapse; Santa Rosa still didn't have a single public-owned park (unless you count the cemetery) and the blight of 1st Street - ramshackle sheds and barns blocking access to the creek and a redlight district that stretched over two blocks - was left alone. It didn't have to turn out this way. Living here at the time was William H. Willcox , a renowned architect who intended to build an auditorium large enough to host state or even national events. Willcox also proposed a design for an expansive water park along the creek. But once the quake hit, nothing more was mentioned in the newspapers about either project; Santa Rosa was focused on quickly rebuilding what was, not taking a little time to think about what it should be. Santa Rosa's fatal flaw in the early 20th century (and still today, I'll opine) was that it had grand ambitions and a terrible lack of foresight. "Build a better and greater Santa Rosa," the City Council proclaimed right after the earthquake, just as there was a mandate the year before for the population to double by 1910. Both messages shared the same underlying notion: Build, build, build, as fast as you can. Planning may be okay for lesser towns, but we're in a hurry to grow big quickly, and if we just have more buildings and a bunch of new people, the place will be transformed into a majestic city. Somehow. Also curbing progress after the earthquake was the dearth of investigative journalism to shine a light on the town's problems. This was the Golden Age of muckraking, and probably every metropolitan area in America had at least one newspaper scratching away at corruption, ineptitude, and graft. For a year-and-a-half before the disaster, the Republican newspaper was leased to a pair of out-of-town firebrands who weren't afraid to peer under Santa Rosa's dirty rocks. They exposed that this became a "wide open town" whenever horses were running at the track, with Fourth Street turned into something like a lawless miner's camp - and that it was a problem that apparently had been an open secret for decades. Then just a couple of weeks before the quake, they further charged that city leaders were in cahoots with a "scheming coterie of gentlemen who manage to protect their private interests by the conduct of the city government through the present administration." If they had kept up the call for reform, it's likely that Santa Rosa would have followed San Francisco's lead in holding Grand Jury hearings concerning the town's political elite. But after publishing a single edition the afternoon of the earthquake, the reform-minded team apparently left town, and the Republican lapsed a week later to the control of mild-mannered owner and former editor Alan Lemmon. The "Democrat-Republican" that spanned about two weeks was a joint effort in name only - it was clearly the creation of Press Democrat editor Ernest L. Finley, always the uncritical booster of Santa Rosa's business interests. After a premiere editorial calling for citizens to stand "shoulder to shoulder" in egalitarian spirit, the following issues used the precious little space available to mainly push for widening downtown streets, with the apparent hope of the town someday having a San Francisco-sized streetcar system to serve that coming city of majesty that would sprawl over the entire Santa Rosa Plain. The one saving feature of the situation is that "we are all in the same boat." As a result of the complete destruction of the city's business interests, no man has any advantage over his neighbor. To put it frankly, we are all broke, and the moment anybody asks us to liquidate "the jig is up." It is only by standing shoulder to shoulder for the rehabilitation of Santa Rosa, and showing our faith in the future and confidence in each other, that the great problem which now confronts this community can possibly be worked out. We will all pay when we can. Sonoma County will have to build a new courthouse, and the county will have to be bonded for the purpose. While we are about it, we might as well build it right. A modern, up-to-date structure is the only thing that will fit the bill. Property in Santa Rosa will soon be at a premium, and worth more than ever before, because Santa Rosa is going to be a better and more prosperous town than it has ever been. One of the first things the City Council should attend to is the establishment of the new street lines. All the business streets should and must be widened, and now is the time to do it. For a long time it has been generally recognized that the majority of Santa Rosa's business streets were too narrow, and now that the opportunity for widening them has arrived it must be embraced. It will only be a few years until electric cars are occupying all our principal streets, and in addition to this the ordinary demands of business must be considered. Third, Fourth, Fifth, A, B, Main, Mendocino and D streets can now be improved in the respect noted without difficulty and practically without cost, and the authorities should see to it that the lines are set back before any of the foundations of the new buildings talked of are laid. We have it in our power to make Santa Rosa one of the finest and most attractive little cities in the whole country, and we will be playing false to our own best interests if we fail to do so. "First meeting of the Board of Supervisors and County Commissioners after the Earthquake" on April 23, five days after the disaster. According to the Democrat-Republican, little was done at the meeting except ordering cleanup of wreckage at the courthouse, seen to the left. Note that everyone wearing a hat has an access pass in the hatband.